"Saint Remy" redirects here. For other uses, see Saint-Rémy (disambiguation). Saint Remigius, Remy or Remi, (French: Saint Rémi or Saint Rémy; Italian: Remigio; Spanish: Remigio; Occitan: Romieg; Polish: Remigiusz; Breton: Remig and Lithuanian: Remigijus), was Bishop of Reims and Apostle of the Franks, (c. 437 – January 13, AD 533). On 25 December 496 he baptised Clovis I, King of the Franks. This baptism, leading to the conversion of the entire Frankish people to Christianity, was a momentous success for the Church and a seminal event in European history. Remigius was born, traditionally, at Cerny-en-Laonnois, near Laon, Picardy, into the highest levels of Gallo-Roman society. He is said to have been son of Emilius, count of Laon (who is not otherwise attested) and of Celina, daughter of the Bishop of Soissons, which Clovis had conquered in 486. He studied at Reims and soon became so noted for his learning and sanctity, and his high status, that he was elected Bishop of Reims in his 22nd year, though still a layman. He was both Lord Chancellor of France and Référendaire of France. The story of the return of the sacred vessels (most notably the Vase of Soissons), which had been stolen from the church of Soissons, testifies to the friendly relations existing between him and Clovis, King of the Franks, whom he converted to Christianity with the assistance of Saint Vedast (Vedastus, Vaast, Waast) and Saint Clotilde, the Burgundian princess who was wife to Clovis. Even before he embraced Christianity, Clovis had showered benefits upon Remigius and the Christians of Reims, and after his victory over the Alamanni in the battle of Tolbiac (probably 496), he requested Remigius to baptize him at Reims (December 25, 496) in the presence of a large company of Franks and Alamanni; according to Saint Gregory of Tours, 3,000 Franks were baptized with Clovis. King Clovis granted Remigius stretches of territory, in which Remigius established and endowed many churches. He erected bishoprics at Tournai; Cambrai; Thérouanne, where he personally ordained the first bishop in 499; Arras, where he installed St. Vedast; and Laon, which he gave to his niece's husband Gunband. In 530 he consecrated Medardus, Bishop of Noyon. Remigius' brother Principius was Bishop of Soissons and also corresponded with Sidonius Apollinaris, whose letters give a sense of the highly cultivated courtly literary Gallo-Roman style all three men shared. The chroniclers of "Gallia Christiana" record that numerous donations were made to Remigius by the Frankish nobles, which he presented to the cathedral at Reims. Though Remigius never attended any of the church councils, in 517 he held a synod at Reims, at which after a heated discussion he converted a bishop of Arian views. Although St Remigius's influence over people and prelates was extraordinary, upon one occasion his condoning of the offences of one Claudius, a priest whom Remigius had consecrated, brought upon him the rebukes of his episcopal brethren, who deemed Claudius deserving of degradation. The reply of Remigius, still extant, is able and convincing. Few authentic works of Remigius remain: his "Declamations" were elaborately admired by Sidonius Apollinaris, in a finely turned letter to Remigius, but are now lost. Four letters survive: one containing his defence in the matter of Claudius, two written to Clovis, and a fourth to Bishop Falco of Tongeren. The "Testament of St. Remigius" is apocryphal. A brief and strictly legendary "Vita" was formerly ascribed to Venantius Fortunatus. Another, according to Jacobus de Voragine, was written by Ignatius, bishop of Reims. A letter congratulating Pope Hormisdas upon his election (523) is apocryphal, and "the letter in which Pope Hormisdas appears to have appointed him vicar of the kingdom of Clovis is proved to be spurious; it is presumed to have been an attempt of Hincmar to base his pretensions for the elevation of Reims to the primacy, following the alleged precedent of Remigius." A Commentary on the Pauline Epistles (edited Villalpandus, 1699) is not his work, but that of Remigius of Auxerre. St Remigius' relics were kept in the Cathedral of Reims, whence Hincmar had them translated to Épernay during the Viking invasions and thence, in 1099 to the Abbey of Saint-Rémy. His feast is celebrated on October 1. 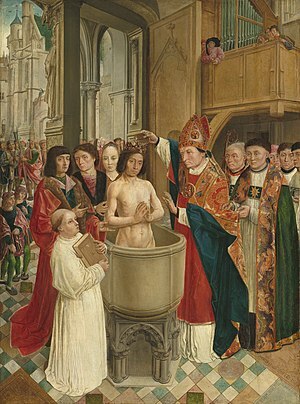 St. Remigius is known per the Legend of the Baptism of Moribund Pagan, according to which a dying pagan asked for baptism at the hands of St. Remigius, but when it was found that there was no Oil of the Catechumens or sacred Chrism available for the proper administration of the baptismal ceremony, St. Remigius ordered two empty vials be placed on an altar and as he prayed before them the two vials miraculously filled respectively with the necessary Oil of the Catechumens and Chrism. Apparently when the sepulcher containing the body of St. Remi was opened in the reign of Charles the Bald and while Hincmar was the Archbishop of Reims, two small vials were found, the contents of which gave off an aromatic scent the likes of which was like nothing known to those present. If one recalls that when St. Remigius died the ancient art of perfumery was still known and practiced in the collapsing Roman Empire, but was unknown in the Carolingian empire four hundred years later, these vials may have originally been bottles of unguents used to cover the scent of decay of St. Remigius’ corpse during his funeral. But the memory of the two vials miraculously filled in the story of the Baptism of the Moribund Pagan, and the unusual, seemingly otherworldly scents issuing from these two vials found buried with St. Remigius combined to suggest to those present that these two vials were the miraculously filled vials of the legend. It should be remembered as well that it was not uncommon for chalices, patens, and other sacred vessels to be buried with high-ranking clergymen. Hincmar adroitly combined the discovery of (1) the two vials (2) the Legend of the Moribund Pagan and (3) the historical memory that St. Remigius had baptized Clovis, into the Legend of the Sainte Ampoule, (i.e., that the Chrism used by Remigius when he baptized Clovis was miraculously supplied by heaven itself). Hincmar used the new legend to strengthen his claim that his own archepiscopal see of Reims (as the possessor of this heavenly sent chrism) should be recognized as the divinely chosen site for all subsequent anointings of French kings. The fate of the second vial is uncertain. It has been suggested that since in the original form of the legend this would have been the vial containing the Oil of the Catechumens and that the French coronation ordinals prescribe the Oil of the Catechumens, rather than Chrism, for the anointing of queens, it was subsequently used for anointing the queens of France It is possible that a vial currently identified by some of the Bourbon Legitimists as the Sainte Ampoulle is actually this second vial. 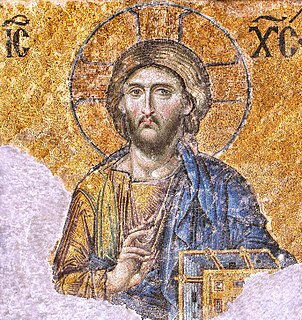 ^ Great Synaxaristes: (in Greek) Ὁ Ἅγιος Ρεμίγιος Ἐπίσκοπος Ρημῶν. 13 Ιανουαρίου. ΜΕΓΑΣ ΣΥΝΑΞΑΡΙΣΤΗΣ. ^ a b January 13 Archived 2011-10-12 at the Wayback Machine. The Roman Martyrology. ^ The legend of the ampulla of holy oil that was used to anoint the kings crowned at Reims originated after St Remigius' time, with Bishop Hincmar of Reims. ^ Jacobus de Voragine, The Golden Legend, October 1: "St. Remigius." ^ The Legend of the Ste. Ampoule by Sir Francis Oppenheimer, KCMG, Faber & Faber Ltd., 24 Russell Square, London. Jacobus de Voragine, The Golden Legend, October 1: "St. Remigius." Wikimedia Commons has media related to Saint Remigius. Wikisource has the text of the 1913 Catholic Encyclopedia article St. Remigius. Chrismation consists of the sacrament or mystery in the Eastern Orthodox, Oriental Orthodox and Eastern Catholic churches, as well as in the Assyrian Church of the East initiation rites. The sacrament is more commonly known in the West as confirmation, although Italian normally uses cresima ("chrismation") rather than confermazione ("confirmation"). The Battle of Tolbiac was fought between the Franks, who were fighting under Clovis I, and the Alamanni, whose leader is not known. The date of the battle has traditionally been given as 496, though other accounts suggest it may either have been fought earlier, in the 480s or early 490s, or later, in 506. The site of "Tolbiac", or "Tolbiacum", is usually given as Zülpich, North Rhine-Westphalia, about 60 km east of what is now the German-Belgian frontier. The Franks were successful at Tolbiac and established their dominance over the Alamanni. The Roman Catholic Archdiocese of Reims is an archdiocese of the Latin Rite of the Roman Catholic Church in France. Erected as a diocese around 250 by St. Sixtus, the diocese was elevated to an archdiocese around 750. The archbishop received the title "primate of Gallia Belgica" in 1089. Tilpin, whose name was corrupted in legend as Turpin, was the bishop of Reims from about 748 until his death. He was for many years regarded as the author of the legendary Historia Caroli Magni, which is thus also known as the "Pseudo-Turpin Chronicle". He appears as one of the Twelve Peers of France in a number of the chansons de geste, the most important of which is The Song of Roland. His portrayal in the chansons, often as a warrior-bishop, is completely fictitious. The Oil of Catechumens is the oil used in some traditional Christian churches during baptism; it is believed to strengthen the one being baptized to turn away from evil, temptation and sin. Saints Nazarius and Celsus were two martyrs of whom nothing is known except the discovery of their bodies by Saint Ambrose. Aurelianus was a Gallo-Roman statesman, commander and magnate in the late 5th-century Gaul. He was also a duke of Melun, but most importantly, the chief advisor of Clovis I.